It's been so long since I read (and reviewed) a Judy Moody or Stink book (6 years!) that I forgot how much I love both of these characters - especially when their series cross paths. Double rare! Megan McDonald and Peter H. Reynolds have created truly memorable characters in these siblings. 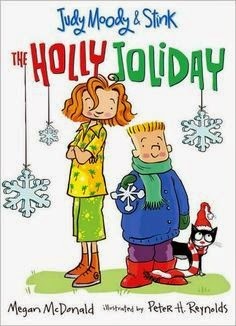 On top of that, way back in 2005, five years after the debut of the first Judy Moody, McDonald was THE FIRST author to write a chapter book for beginning readers at a slightly lower level than a traditional chapter book like Magic Tree House and Junie B Jones. Last year, other publishers finally caught on to the immense need for this kind of book and now there are enough of them on the shelves for me to create the label Bridge Chapter Books. Judy Moody and Stink: The Big Bad Blackout is written more at the level of a Judy Moody book, but I have no doubt that fans of Stink will want to stretch their reading muscles to get in on the fun. 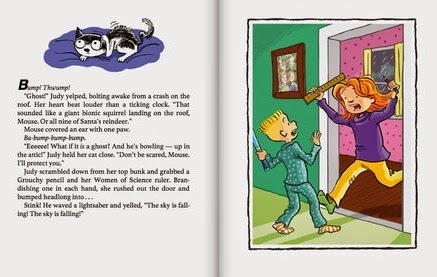 Another thing that makes the joint Judy Moody-Stink books so worth reading are the full color illustrations - both series normally only have black and white interior art. Reynolds's style perfectly captures all that is comfortably familiar and slightly kooky about the Moody family. And all that comes together under one roof in Judy Moody and Stink: The Big Bad Blackout! When Hurricane Elmer hits it's time to batten down the hatches and stock up on supplies. Judy and Stink spend the first morning of the storm happily listening to the school closures for the day, then waiting for mom to make it back from the market and Grandma Lou to make it to their house on higher ground. 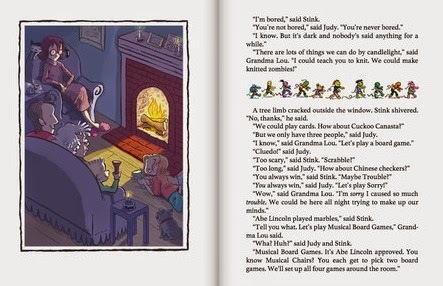 When Grandma Lou finally does arrive, she brings games, stories and activities that will come in very hand when the power cuts out, along with Gertrude, Milo and Candy Cane. Gertrude is Lou's kayak, which plays a very cool part in the end of the story, and Milo and Candy Cane are her neighbor's ferret and corn snake, respectively. While there are only a handful of books that feature a loss of electrical power as a plot point (be sure not to miss John Rocco's Caldecott Honor winner, Blackout) they do all seem to embody the happy theme of a lost creativity and togetherness returning in the face of a seeming hardship. And I never get tired of the story playing out this way! Even though I know it's the right thing to do, I need a frequent reminder to disengage from isolating devices and spend time together. 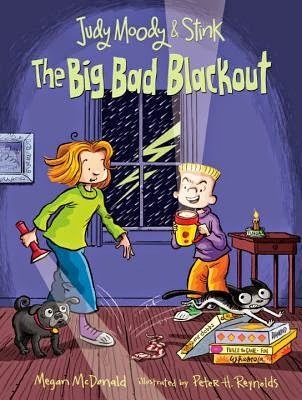 The superb thing about Judy Moody and Stink: The Big Bad Blackout is that it encourages this kind of disengaging and coming together while at the same time giving kids and parents some really great ideas of things to do! With the power out and the Moody's gathered around the fire, it's not long before Stink is proclaiming his boredom. Grandma Lou's offer to teach the kids to knit zombies falls flat and Stink vetoes all of Judy's board game suggestions until Grandma Lou comes up with the idea of Musical Board Games. The battery-operated boom box is pulled out and the challenge begins. I am definitely trying this with my kids in the near future! A round of story telling follows, with Grandma Lou and Mom and Dad contributing very entertaining stories of how hurricanes affected there lives. In between, dinner is cooked over the fire (in the fireplace) and lots of laughs are had. Ghost stories are told and Grandma Lou scares Stink and Judy more than a little. This, in turn, results in a pretty great prank the two play on Grandma. School is cancelled again and, when the Moody's wake in the morning, the storm is over but the backyard is flooded. This is where Gertrude comes into the story, along with a promise on the part of Stink, Judy and Grandma Lou to make sure there is more unplugged time in the very near future. And hopefully another special edition! This was one of our all time favorites, even listening to it on audiobook long after have finished reading the book. I've missed out on that last couple books, but happy it is still be read by so many.